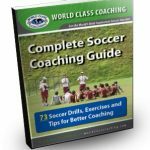 The video below is provided by World Class Coaching, a really great resource for soccer coaches. 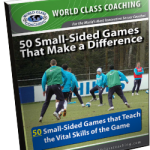 World Class Coaching has graciously offered three of their eBooks to you for FREE simply click on the images below the video for your free download. In the clip Rob Gale, head coach of the Canada U-20 Men’s National Soccer Team, instructs players during his Three Against One demonstration. This is a very simple and effective drill that could be used during a practice session or during a pre-game warm up. There are 5 x 5 yard squares set up on the field with three offensive players that each have a soccer ball on the outside. There is one defensive player in the middle of the grid that will have to play defense against all three of the offensive players. Once the drill starts, each offensive player has to dribble to a different side of the grid. If they move to a side adjacent to where they started, they get one point for successfully dribbling there without the defender stealing it or getting a touch. If the offensive player can dribble to the opposite side of the grid, they get three points for successfully completing this. The coach starts the drill and goes for 45 seconds with each offensive player keeping track of how many points they earn. The player with the lowest number of points has to play defense for the next round. The player in the middle that played defense would then switch to the outside to dribble and play offense. This drill allows coaches to focus both on offense and defense with their players. The offensive players get work in by dribbling in tight spaces that requires them to have their head up and dribble quickly in order to make it to one of the sides successfully. The defensive player in each grid gets experience with having to close down players quickly in tight spaces while constantly making decisions on who they can defend and who is their best option to defend. All the players involved in the drill get quality work in during a short amount of time. The YouTube video below has audio, so please make sure that your sound is turned on. Please note that some schools block access to YouTube.